[The mitzvot requiring action were a major theme in Essay IV. There the Alter Rebbe explained how their observance extricates and elevates the sparks of holiness that originated in the World of Tohu and that are embedded in this material world, and thereby causes G-dliness to descend there. The same, it was stated, is true regarding the study of the laws that govern the mitzvot. The Alter Rebbe went on to say that this applies as well to the prohibitory mitzvot, where one cannot apply the dictum that "it is considered as if one performed the command." Moreover, Torah study remains valuable even with regard to the laws concerning situations that will never occur, even though there too we cannot say that "if one remained passive and did not transgress, he is rewarded as if he had performed a mitzvah." Nevertheless, even in such cases, a Torah law draws down Supernal Wisdom within the world. In this Essay, the Alter Rebbe will state that although it would seem that purifications (beirurim) cannot be brought about when studying these types of laws (for one only draws down Supernal Wisdom), yet in point of fact, purifications do come about through this Torah study. Let us understand [how this applies to] the details of the laws that never occur at all, and possibly never actually existed, and certainly will not come to pass in the Time to Come; for example, the detailed laws of pigul (1) and the like. It is known that every prohibited thing in the world has a source and a root of life in the kelipot. Therefore even the particular prohibitions that never became practical issues in this physical world, still the roots of their life-force do actually exist in the spiritual chambers of the kelipot. Even the particular instances that possibly never did and never will actually occur, for example errors and unwitting misdeeds, like [when tithing] erroneously calling the ninth [sheep] the tenth, (3) and the like, the kind of eventuality that cannot be deliberate and thereby cause a kelipah to light upon it. Possibly in these circumstances it does not exist in the chambers of the kelipot. appears to me that the Alter Rebbe uses the word "possibly,"
implying uncertainty, because unwitting errors derive from nogah. In any event, it does exist [if not in kelipot, then] at least - keeping in mind the distinction between the sacred and the profane - in the Supreme Wisdom that issued and descended in this detail to Moses at Sinai, (4) (in the expression, (5) "Whatever teaching) any seasoned student will one day innovate... (was taught to Moses at Sinai)." [The question discussed there is whether a firstborn animal can be considered to have directly "opened the womb" (and hence be sanctified) in either of two hypothetical cases. According to Rashi, it is a question of what happens if the person assisting in the birth entirely wraps up the animal as it is born. For the extension of the Supreme Wisdom that is vested in the laws of Torah is infinite, since the Infinite is actually clothed in it. Every particular of the law is a gate drawn from the Supreme Wisdom which "founded the daughter," and is clothed in it. [Chochmah (the "father") founded Malchut (the "daughter"). And from [Malchut], [Chochmah] is drawn and invested in Beriah, Yetzirah and Asiyah. It is known that the nurture of the kelipot derives from the hinderpart of the Ten Sefirot of holiness, and more precisely, from the garments of the Ten Sefirot of Beriah, Yetzirah and Asiyah, and yet more precisely, [they derive their nurture from the garments] of Yetzirah and Asiyah that are intermingled with kelipot. [The evil of the kelipot in the Worlds of Yetzirah and Asiyah is intermingled with the good,] for, as is known, their nurture derives from the state of garments. Through the study of the laws, in speech and in thought, they become separated (10) and distinct from the sacred. Thus it is stated in Tikkunim and Raya Mehemna,(11) "To separate (4) (etc. the kelipot from holiness through Torah study)." This accords with what is known concerning the teaching of our Sages (12) [in answer to the prophet's query, (13) "Why was the land destroyed? "]: "For they did not recite the blessing before Torah study...."
This [separation] is effected by drawing down the infinite light into the Supreme Wisdom clothed in them, [in the laws of the Torah]. Through Chochmah they are sorted out - through the infinite light that is within it, [i.e., within Chochmah. This is equally true regarding the study of the laws of prohibitory commands, even those that most probably will never occur. For the Torah study itself accomplishes this purification]. This [light] is drawn into the Supreme Wisdom by the supernal "likeness" of man, who is also occupied with these laws above. [When a man studies Torah below, his source above engages in Torah study as well], in its source in nukva of Za of Beriah, Yetzirah and Asiyah. Thus we can understand the requirement (14) that every Nefesh - Ruach - Neshamah fulfill all 613 commandments in thought, speech and deed, meaning the details of the laws, [for thought and speech refer to the study of all these details]. They [any Nefesh - Ruach - Neshamah that failed to complete a previous mission in this world] must be reincarnated to fulfill the Torah - in its simple meaning, allusions, homiletics and secrets, (15) in order to sort out and refine all that pertains to them from among the 288 sparks that constitute the complete structure of man, with the 613 categories, general and particular, [that relate to each soul]. But in the Time to Come, when the refinement is culminated, the study of Torah will be in the form of "do good" alone, [and no longer in order to separate good from evil]. [Its purpose will be] to elevate the Nefesh - Ruach - Neshamah ever and infinitely higher; and also, with regard to [the study of] the 365 prohibitions, [to elevate them] to their source, the holy attributes of Severity, and to "sweeten" them through the attributes of Kindness that are in the 248 positive commandments, and to fuse them - [the attributes of Severity with the attributes of Kindness]. The entire Torah is thus eternal in general and in detail. [I.e., including even all the detailed laws that have no practical application at all in the Time to Come]. For even the individual laws of the 365 prohibitions are branches of the TorahÕs general statements. All of them have a source above in the five holy attributes of Severity, just as the 365 prohibitions themselves as they are above, in the state of "blood" that animates the organs of the vessels of Za. 1. Vayikra 7:18; Zevachim 29a. 2. See Zohar I, 166b. 4. The brackets/parentheses are in the original text. 5. Cf. Megillah 19b; Yerushalmi, Peah 2:4; et al. the House of Study because of problems which he solved]. 9. Tikkunei Zohar, in the Introduction which begins, Patach Eliyahu. 10. Emended according to Luach HaTikkun of the Rebbe. 11. See Zohar III, 11b; 27b. Torah [1:4, and sources cited there]." PARDESS - "In the Pardess" (lit., "orchard" of the Torah). or young birds from a nest (see Positive Mitzvah 148). to take the young while the mother bird is still in its nest. Torah lessons: Chumash: Vayishlach, Shishi with Rashi. My father said: Chassidus changes what exists, and uncovers the essence-character. The essence-character of the Jewish person is beyond estimation and assessment, for he is a part of (G-d's) Essence, and whoever lays hold of a part of The Essence is as though he lays hold of it all. Just as The Essence is unlimited, so is the part unlimited. This is similar to Tzitzit being "on the corner" (1) - i.e. "of the same material as the corner" (2) of the garment. (The existence of the soul as an entity discrete from G-d's Essence) is only because G-d (3) created the soul to be a created being; and Chassidus reveals the essence-character (of the soul). In the first decades of the 5th century, Rav Ashi (d. 427) and Ravina I (d. 421) led a group of the Amoraim (Talmudic sages) in the massive undertaking of compiling the Babylonian Talmud [http://www.ucalgary.ca/~elsegal/TalmudPage.html] -- collecting and editing the discussions, debates and rulings of hundreds of scholars and sages which had taken place in the more than 200 years since the compilation of the Mishnah by Rabbi Judah HaNassi in 189. The last of these editors and compilers was Ravina II, who passed away on the 13th of Kislev of the year 4235 from creation (475 CE); after Ravina II, no further additions were make to the Talmud, with the exception of the minimal editing undertaken by the Rabbanan Savura'i (476-560). This date thus marks the point at which the Talmud was "closed" and became the basis for all further exegesis of Torah law. Art Scroll's 20% OFF Chanukah Sale! 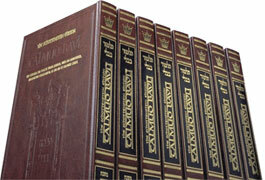 Click HERE to start saving on the over 1,500 items at www.artscroll.com, including our classics such as the Stone Edition Chumash, Schottenstein Edition Talmud, Sapirstein Edition Rashi Chumash, ArtScroll Prayer Books, and much more! Click HERE to sign up and receive artscroll.com's free email newsletters full of updates, special offers, and timely information on ArtScroll products. A7news: Gaza Farmers: How Do Those Israelis Do It? PA Farmers in Gaza: How Do Those Israelis Do It? After years of producing bug-free lettuce and other vegetables for Jewish farmers, the sands of Gaza have reverted to their old ways. PA farmers report failure in keeping the bugs away. 1. PA Farmers in Gaza: How Do Those Israelis Do It? The Gaza Arabs who have taken over the hothouses of what used to be Gush Katif reported to the Israel-PA Coordination Office that they have failed in raising bug-free vegetables. In addition, the PA workers complain that their wages from their compatriots and brethren are significantly lower now than what they received from the Israelis. Arutz-7's Haggai Huberman reports that the Jews of Gush Katif operated 3,600 dunams (890 acres) of hothouses as of last year, of which the PA - with international help - has managed to activate three-fourths. The Arabs had hoped to build on the Jews' success, selling to the market the Israelis had built up over the years. The bug-free vegetables were particularly attractive to the religious and hareidi-religious publics, for reasons of kashrut. "Those houses have been here since before the Six Day War. If they wanted this land, what stopped them from spreading out to here before? ... When we first came, they told us that we were crazy for even trying to build something here. 'The land is cursed,' they told us. Well, we built something, something very great..."
"It is difficult for me to believe that this obviously blessed area is the very same area that our Moslem neighbors called the ‘cursed land’ of El G’erara. They have told me that nobody lived in this area from the time that the last Jews left because there was not enough rain, and nothing could grow properly. They were happy when the Jews returned because the rain started again, and the land began to produce." Farmers in Gush Katif were considered among Israel's most successful; their total annual exports totaled $100 million, or 15% of Israel's agricultural exports. Of Israel's exports abroad, Gush Katif exported to Europe 95% of the bug-free lettuce and greens, 70% of the organic vegetables, 60% of the cherry tomatoes, and 60% of the geraniums. Israel's largest plant nursery was in the Gush Katif community of Atzmonah. Other Katif produce included spices, green, red and yellow peppers, celery and more. Israel's Defense Ministry sources told Huberman that the Palestinian Authority farmers were unable to develop the techniques necessary for bug-free produce. Some of the original Israeli greenhouses were damaged or destroyed by Arabs immediately after Israel withdrew, but the PA was able to rebuild them. As of now, the only crop the Arabs are raising successfully is strawberry. Former U.S. Justice Department prosecutor and intelligence expert John Loftus says that Israel is unable to thwart Iran's nuclear projects through military action – but that there is an alternative. "Israel only has a few option and striking back is not one of 'em," Loftus told Israel National Radio's Tovia Singer. "The F-16-IL version that Israel possesses only has a combat radius of about 2,200 kilometers and you would need about 3,000 to hit the hard targets in Iran. Iran saw what [Israel] did to the Osarik reactor in Iraq and have spread their nuclear development stuff all over the country and a lot of the stuff is in the northeast corner of the country – completely out of Israel's flight range. So, unless Iraq votes to allow Israel overflight rights to attack Iran – which isn't going to happen - then Israel simply doesn't have the fuel to fly around Saudi Arabia to come up the Straits of Hormuz and attack Iran. There is simply not a military option available to Israel." Loftus stressed, however, that there are other options that are likely to succeed and are already being put into effect. "The Bush administration is hoping that, ironically with [French Prime Minister Jacques] Chirac's help, UN pressure will cause a regime-change in Syria. That the [UN's] Mehlis investigation [examining the Syrian government's connection to the assassination of former Lebanese PM Rafik Hariri] is going to come down hard and heavy. The US military is chomping at the bit to go across the border and take out the terror bases in Syria that Assad claims are not there. Once Syria is gone, Iran is isolated, with US troops on both their borders, in Afghanistan and in Iraq." The intelligence expert, who has contacts in the Pentagon, says that the strategy is not for the US to actually invade Iran, but to affect a regime-change. "One of the intelligence agencies, which shall remain nameless, asked me to hold a conference of dissident groups in Iran. We are holding that conference and getting ready for regime-change." Singer asked Loftus why US fighter jets do not bomb Iranian nuclear targets on their own from aircraft carriers in the region. "That's a real good question that has been carefully studied," Loftus answered. "There are over 360 separate targets inside Iran that have been identified. Most of them are non-vulnerable – many underneath residential neighborhoods and Islamic shrines. These are not places we can bomb. The Iranians were paying attention when Iraq's reactor was bombed and have learned the lessons." "So what is to be done to bring about a regime-change?" singer asked. "The aircraft carriers are there to defend the picket-line of ships that will place a blockade on the Straits of Hormuz," Loftus said. "Ninety percent of Iran's economy is based on oil exports – so a blockade of as little as three weeks can cause their economy to collapse, the people to rise up and the mullahs to be overthrown. The problem with this is that Iran knows that this is the most likely scenario and they have been preparing for three years to thwart it. They [Iran] have developed vessels whose job is to sink as many oil tankers as possible to block the Straits of Hormuz [to other countries that use that route]. Once two, three or four vessels are sunk, you have cut off 40% of the world's oil supply. So the US doesn't mind – we have a six-month stockpile of oil - but the EU is much more fragile and susceptible to oil shocks. So we might have to dump a large share of the US stockpile on the world market until the regime falls." Asked whether he really thinks the government will topple so easily, Loftus responded, "It is hard to do polling in Iran – you have to do it by telephone and you therefore only end up talking to the urban population. But we found that 83% of the Iranian urban population hates the mullahs and don't want to grow up under a dictatorship. Most of the country is young and wants music videos and TV and not the mullahs." The National Union Party says it's still leaving the door open for a merger with the NRP, but in the meantime, kicked off its election campaign today. The party's slogan: Orange Now. The party's banners and stickers will be orange-based, reminiscent of the color that marked the year-long struggle against the withdrawal/expulsion from Gush Katif and northern Shomron. The National Union aims to focus its campaign on fighting Ariel Sharon's plans to further erode the Jewish People's hold on the Land of Israel. MK Tzvi Hendel said today, "Arik Sharon established the Kadima party because he wants to go down in history as the one who threw us out of all the mountains of Judea and Samaria. He was afraid that in the Likud, he wouldn't be able to do this." Unity talks between the NU and the National Religious Party are stalled, mainly over the question of who will head the list. Both parties say they want the merger, as do many leading rabbis and many others in the religious-Zionist camp, but it has been put on hold for a while. At the press conference kicking off the National Union's campaign today, Hendel further said, "The residents [of Judea, Samaria and Gaza] are the ones who made sure that there would not be a civil war; the Prime Minister would have had no problem opening fire [on them]." "We must gather all our strength and public responsibility," Hendel said, "in order to increase the strength of the right-wing. There are many people in the nationalist camp who have lost hope and who say they are sick of the situation and will not go to vote. I call upon all of them to vote; let us gather our strength and make the revolution." The party promises not to ignore social issues, which are gearing to be a major part of the election campaign. Party leader Benny Elon points, as examples, to MK Uri Ariel's legislation mandating Sabbath elevators in tall buildings with a demand for such and in public buildings, and MK Tzvi Hendel's efforts to obtain funding for yeshiva high schools. However, the party's main focus will be "Land, People and Torah of Israel" issues. MK Yitzchak Levy said at a recent party gathering, "The day after the election, the social issues will be forgotten, and the diplomatic issues will take their place." Chaim Barbivai, the Mayor of Kiryat Shmonah who was one of the first to join Ariel Sharon's Kadima party, is to be indicted on charges of bribery. Kadima features others under police investigation. State Prosecutor Eran Shendar has approved the decision to indict Barbivai, but the indictment will be served only after Barbivai has had a special hearing. The charges against the mayor are having signed a false affidavit and municipal election law violations. He stands accused of demanding contributions from businessmen and contractors who required his services. Barbivai denies the charges, saying that he was found to be telling the truth in a lie-detector that he initiated. Kadima, formed just last month by Prime Minister Ariel Sharon, features several leading figures who are under criminal investigation or who have been convicted. Sharon himself is under investigation in what is known as the Cyril Kern case, and his son, MK Omri Sharon, was convicted last month of violating campaign laws and perjury. He is expected to face a jail sentence, and just yesterday asked the court to delay sentencing until after the national election "in order not to harm my father's election campaign." The police have also recommended that new Kadima member Minister Tzachi HaNegbi be indicted for allegedly illegal political appointments he made while serving as Environment Minister. Two other Kadima MKs, Eli Aflalo and Ruchama Avraham, were reprimanded by the Knesset Ethics Committee - and are being investigated by State Comptroller Micha Lindenstrauss - for what is known as the Agrexco scandal. The two traveled abroad last year at the expense of Agrexco, a vegetable and fruit exporting company. Agrexco's activities are within the scope of the Knesset Finance Committee on which they serve. After the news broke, the two MKs returned the cost of the flight, 7,300 shekels, and Aflalo also returned another 5,500 shekels for the cost of his New York hotel stay. When HaNegbi joined Kadima last week, Shinui MK Roni Brizon said that at this rate, "the party faction can hold its meetings in the Maasiyahu Prison." His party colleague Reshef Chen said, "It will be interesting to see which of the corrupt Kadima politicians will take upon himself the job of explaining the party's position on 'clean government.'" Commentator Mordechai Gilat, writing for Ynet two weeks ago, asserted that in weighing which of the two parties, Likud or Kadima, was more corrupt, "the Kadima Party wins, hands down: Deceiving the attorney general, perjury, the millions of dollars the Sharon family has taken from private businessmen trying to advance their interests, the Cyril Kern case and silencing of key witnesses are more serious than that the goings-on in Likud." Gilat wrote this before HaNegbi jumped to Kadima and before today's news about Barbivai. "As you know, I have chosen to remain in the Likud, despite the fact that [Sharon or Kadima] promised me the Defense Ministry if I would leave. I chose not to do this, because one does not leave his home, [emphasis in the original], and I intend to remain in the Likud in all situations, and fight for its path! ..."
For the first time in six decades, the Russian city of Bryansk saw a brit milah - ritual circumcision - ceremony, and not only one of them, but eight in one day. The unique event occurred in late November in the Jewish community of Bryansk, 380 kilometers southeast of Moscow. Rabbi Ze'ev Wagner, who serves communities throughout central Russia, and Evgeny Adler, a young local Jewish activist, helped arrange the octuple ceremony. The eight circumcised males ranged from newborn babies to youth and fully-grown men. According to long-time Jewish residents of Bryansk, a member of the Federation of Jewish Communities of Russia, these were the first britot in the town since 1945. The mohel, or ritual circumciser, was Rabbi Yeshayahu Shafit of the Brit Yosef Yitzchak organization. He has chalked up hundreds of thousands of kilometers flying to britot all over Russia. This was the first time he performed as many as eight britot in one day. Rabbi Shafit was assisted by Dr. Albert Belenkiy, an active member of the local community. Rabbi Wagner attempted to convince Dr. Belenkiy to be circumcised as well, to no avail - at first. Moved by the reactions of the "patients," however, and impressed by Dr. Shafit's skills, the 40-year-old physician soon agreed to be circumcised himself. He ran home to bring papers proving his mother's Jewishness, and underwent the religious procedure. Among the other newly-circumcised Jews were the three-month-old grandson of Irina Cherniak, who founded the local "Hesed" (kindness) organization in 1995, the 22-year-old grandson of a Jewish World War II veteran who regularly frequents the Bryansk Synagogue, and local students. Following the ceremony, the adult Jews put on tefillin. Israel's Anti-Drug Authority released a shocking set of statistics today, showing that 300,000 people in Israel use drugs to some extent. The average age for beginners: 12-13. The profile of the typical drug user in Israel is: male, aged 25-34, unmarried, secular, army veteran, parents born in Israel or in western Europe or the U.S. The survey found that 25,000 Israelis are addicted. The findings are based on a poll of no fewer than 12,000 people aged 12-40. Despite the numbers, Chaim Messing, the head of the Authority, reported a "light at the end of the tunnel," in that the "increase in drug use in Israel has been stopped." On the other hand, usage of legal volatile substances among youths has more than doubled since four years ago, from 7.4% to 15.8%. Among adults, the increase was from 4.9% to 7.1%. "The root of the problem," Messing said, "is the general public atmosphere that takes too lightly the problem of drug usage, especially of marijuana and hashish. The youth is flooded with confusing double messages and half-truths, which are more dangerous than outright lies." In this connection, the Authority's site features a biting article about parents and friends who tell youth that "marijuana is nothing, it's just a plant, that alcohol and tobacco are more dangerous... and about 'freedom of expression,' and the right of a person to his own body, and personal rights..."
Messing said, "A society that wants to survive must put a mark of shame on drug dealers, and work towards firm and clear enforcement of drug laws. At the same time, appropriate treatment must be enabled for all victims of drugs, including forced treatment and relevant treatment frameworks of all sectors, including immigrants, Bedouin, women, and others." Quriea announced at the meeting that the PA will be taking positive steps to exert its influence over Jerusalem. He said the PA planned to transfer income support payments to Arab families living in the city. Quriea thanked the government of Saudi Arabia for its contributions towards realizing the PA’s goals in Jerusalem. Jerusalem, the capital of the Jewish State, is under Israeli sovereignty. The city was liberated in two stages, the western part in the 1948 Independence War, and the eastern part in the 1967 Six Day War. The eastern part of the city, which contains the Old City, Western Wall, and Temple Mount, also includes numerous Arab neighborhoods. Up and coming Reggae music star Matisyahu played to sold-out audiences in Tel Aviv and Jerusalem last week. The Israeli public warmly received Matisyahu’s mix of Reggae and Rap music with content containing strong Jewish spiritual messages. Matisyahu's third album 'Youth' is slated for release by Sony records in January 2006. Matisyahu, born 26 years ago as Matthew Miller, was an upper middle class unaffiliated Jew until he underwent a spiritual transformation during a trip to Israel. Upon his return to the US, Miller attended the New School for Social Research and explored the possibilities of Reggae music at various New York City clubs. At the same time, he continued to pursue his religious identity, eventually changing his name to Matisyahu and becoming a Lubavitch Hassid, studying Jewish texts at a Yeshiva (rabbinic seminary) in Crown Heights, Brooklyn. Matisyahu decided to take a break from his full time Yeshiva studies and re-entered the music scene as the world’s first ultra-orthodox Jewish Reggae musician. His first two albums were huge commercial successes, and he was quickly snatched up by Sony Records, which will be releasing his next album at the start of the coming year. Matisyahu attributes his newfound success to divine guidance, claiming that all of his efforts to succeed in the music business before he became religious did not yield results. Miller believes that after he began studying at Yeshiva, G-d began directing the course of his life, including his music, and that is when things started happening for him. Matisyahu draws on his life experience and personal spiritual realizations to create his original music. His lyrics are replete with references to the constant conflicts for a religious person in a modern society and his continued hope for redemption to come. In the song 'Warrior,' Matisyahu writes, "You're a warrior fighting for your soul/Taken from the world above and brought down the world below/You're the son of his majesty/Remember how it used to be/In the light of day it's easy to see/Now it's nighttime/You had to leave." Although his Rabbis showed some concern when Matisyahu announced he would be leaving the yeshiva world to pursue a mainstream Reggae music career, they ultimately came to accept and even glorify Matisyahu's musical achievements. Matisyahu describes his musical career as an extension of the Chabad Lubavitch outreach efforts; his goal is to bring the messages of truth and spiritual clarity to a wide-based audience. While some Jewish authorities may frown upon Matisyahu's appearances to a mixed audience, the singer explains he is careful not to transgress any Jewish laws while still providing an atmosphere of freedom that welcomes anyone who wants to come to his shows. Unlike most religiously motivated Jewish musicians, Matisyahu made the decision not to limit his music to a Jewish-only audience. As a result, Matisyahu has become the first religious Jewish artist to appeal to a mainstream audience. He attributes his ability to crossover into the popular music world to his continuing to see himself as the same person he was before he became religious. Although Matisyahu’s music is enjoying growing popularity in the US, ironically, in Israel, he is still relatively unknown. Matisyahu continues to feel a strong connection to Israel, and described his visit to Israel as a visit home. He said he hoped to use his Israeli tour to forge contacts with local musicians and visit Israel’s holy sites, including the Western Wall and the mystic northern town of Tzfat. The audiences at Matisyahu's Israeli shows were packed with a rare mix of secular, religious and hareidi-religious coming together to enjoy authentic Jewish Reggae. "This is the real test, to perform close to G-d. My music makes a place for people. They can tear down the walls and go inside it. If the music was in the background and my whole purpose was to bring people closer to G-d, it wouldn't have had any chance of catching on like it has. It goes way beyond that," Miller told Haaretz. He added, "It's not that I think it will bring world peace or anything like that. But there will be religious people at the concert and a lot of secular people, just like in my shows here, in America, and I think this music has the power to bridge between the two." In the first event of its kind in Israel's history, an endangered Asian Elephant in Jerusalem's Biblical Zoo has given birth to a baby elephant, after fertility treatment and an arduous labor. The mother, named Tamar, was in labor for four hours, at which point a live internet broadcast of the birth was halted and veterinary staff decided to hasten the birth. Two hour later the calf was born – healthy and weighing 198 pounds. The baby elephant, its birth, and a live broadcast of it with its mom during daylight hours can be viewed by clicking here. The baby elephant is the first to be born in Israel, and just the 11th Asian Elephant on earth to be born through the complex fertility method. Zookeepers were concerned that the fact that Tamar was raised in captivity would preclude the 21-year-old elephant from bonding with her child. The mother and child quickly bonded, however, and they can be seen on the zoo's web site. An endangered species after being hunted throughout the ages for the ivory in their tusks, less than 50,000 Asian elephants now exist worldwide. The Biblical Zoo currently is home to one male and four female Asian elephants. Their names are Teddy (after former Jerusalem mayor Teddy Kollek), Susan, Avigail, Michaela and Tamar. All of the females of the herd came from Lampang in Thailand, while Teddy hails from the Safari Park in Ramat Gan. The Biblical Zoo, which displays animals mentioned in the Bible alongside specific passages referring to them, was also recently blessed with the birth of a new giraffe, named Shelly (pictured below). Criticism of DM Mofaz's move to Kadima continues. These are battles between Christian Evangelicals, with some support from Orthodox Jewry, on the one side (Right) and liberal churches, Reform Judaism and secularists, both Jewish and otherwise, on the other side (Left). The US is dictating policy to Israel and the Israeli government is issuing bland assurances that should have Israel's supporters in the US rather concerned, if only they knew about them.